"I thought my applesauce was the best - but Linda's Gourmet Applesauce is even better than mine!" We enjoyed our 1ST taste last night and they are BEST!!! No more frying for me!!! Happy Holidays!! "This past December (2010) my Birthday was at the end of Chanukah and we were on a cruise. When I returned home, I received a wonderful gift of these mouth-watering mini latkes. Bummer—I was sick, so they stayed frozen unitl tonight (1/26/11). Tonight we feasted and gorged ourselves on these yummy warm latkes smothered in sour cream (we love it that way). My husband loved the sweet potato and traditional whereas I adored the green onion. I would order them for myself. Your website is now in our 'favorites list' and I wouldn't hesitate to send them to a family member for a special gift. I can see why Oprah rated them so highly. They are truly worthy of praise. Thanks so much." "Each Christmas Eve, we celebrate the traditional Polish 'Wigilia.' 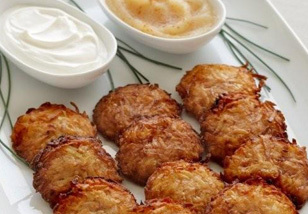 I always serve these latkes with applesauce just after we exchange the 'oplatki' wafers. They have become an important part of the most blessed night of the year. Thank you for doing all of the hard work and allowing me to pass an honored tradition on to the next generation. Christmas Blessings,"
"We had our Chanukah party tonight at Temple B'nai Israel in Oklahoma City. The latkes were the best we've ever had (shh! don't tell the sisterhood ladies who usually do the cooking!)" "OK, Our party is now over, we had 50+ people and served WAY too much food, but of all the varieties of food offerings—The Latkes were a run away smash! We just couldn't decide between the Sweet Potato vs. the Original Flavor. By the way, it is possible I held back a few for myself for after the party! Thanks much for the great service and offering an even better product." "We have enjoyed your latkes for about three years now. Please do not ever stop making them. My Hanukkah party would not be the same without them. There are never any left! Please keep me on your mailing list. I do give you all the credit for them. They are truly perfect in every way. Til next Hanukkah, my regards." 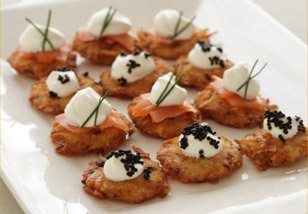 "After a lot of research to find mini latkes for a holiday party we were throwing, I stumbled onto your website. After seeing all the upscale stores you sell to in Southern California and the great testimonials on your website I was swayed enough to give them a try and was happy to find that you sell to a store in New York City. What a hit! I served them with a choice of applesauce or creme fraiche and was so pleased with the taste and the feedback from all who tasted them. They are so easy to cook, smell yummy and taste absolutely fantastic. I have been spreading the word... Thank you and thank Grace's Market in NYC for supporting you and your product." "I fixed and had the latkes at my church on Sunday, Dec. 13th. Everyone loved them and with all I had not a one was left—the potato, sweet potato, and the spinach were excellent. I would recommend you to anyone and would purchase them again from you. Thanks again." "The students tore through all of the Latkes that you sent us, looks like we will have to add yet another container for next year. Thanks for making the students Hanukkah a memorable one. Until next year." "I just wanted to tell you that I had a bunch of people over last night for a 'Hanukah Hop' complete with your latkes (I have been way too busy to stand and fry) and they were amazing. Just wonderful and even though I thought I was crazy to pay so much for shipping, it was worth every penny. I can't wait until you get them in St. Louis. There is a huge Jewish community here and if you are Kosher - they would love you! I am so glad I bought that Real Simple magazine at the airport. Who would have thought? Thanks!" "So after doing much searching and research and trying I don't even know how many different kinds of latkes, I finally found Linda's Latkes!!! It was luck of the draw and when we finally spoke I knew it would be a great pairing for both of us. Linda is very knowledgeable about her product and backs it up completely, it's like hiring your grandmother to come over and cook for you. They taste just like a simple family recipe and reheat just as nicely as if you made a batch and froze them yourself. Reheating them is very easy and you would never know it was a purchased product. I hope to continue to use Linda's Latkes they are an inessential part of our business now." "Well, Linda... they are amazing!!! I had 8 people for dinner the other night; just a Sunday night soup supper, at the last minute I pooped two of my boxes of latkes in the oven...and they disappeared as soon as I put them on a plate. They are wonderful. Thanks so much for your magic touch and making ME look so good. I am going to a 'comfort food' dinner on January 26th, and will pass off the latkes as my own! Sorry, Linda. Thanks again. I LOVE them." "Hi, Just wanted to let you know that the latkes arrived at George Washington University today in time for Chanukah. My daughter and her friends said they were absolutely delicious. You helped make Chanukah special for a whole bunch of college students away from home for the holiday. Thank you again." "I finally picked up latkes at Grace's in NYC. I was doubtful whether they could really be so much better than the frozen ones I usually get, especially since I froze them, but they were outstanding! I'm glad I saw the article in New York Times." "Linda: Happy Hanukah and hopefully you are having some time to enjoy the holidays between orders. I just wanted to let you know that I picked up some of your latkes at Vicente Foods last week as my plans to make latkes for the first night became impossible with my chauffeuring duties. So, I remembered they were there, ran in, rushed home and the whole family raved!!! They were fabulous. So thank you for rescuing me from Jewish Mother shame of no latkes on the first night of Hanukah." "Wanted you to know that they live up to the hype. Really Great!" "Hi, So I brought your latkes to our family Chanukah party. As you know everyone is an ice cream expert, a toilet paper expert and a latke expert. After having dinner all the latke experts turned in their credentials. They realized they didn't know how good latkes can taste. The next day my dear Aunt, matriarch of our family, 93 years old, quietly asked me for my recipe for latkes. She said we will never have to make latkes again. So now that the latke situation is resolved we will continue to fight the good battle over sour cream, applesauce, sugar etc. Then to top it off I was reading the Williams-Sonoma catalog that night and there you were again. Congratulations! You deserve all the acclaim coming to you." "I just received my order and they are excellent, mouth-watering. Please keep me informed as to when a store near me carries them. I live in West Hartford, CT 06017. Thank you." "I now know first hand how wonderful these latkas are. With all the cooking I did for my holiday dinner the Latkas were everyones favorite!! " "I wanted to follow-up on our luncheon meeting at which we served Linda's Gourmet Latkes. There are not enough superlatives to describe these latkes. They were flavorful, crispy, and light. The variety was outstanding! Our Sisterhood absolutely enjoyed every bite! You have created a real Fan Club here in Highland Park, IL. They ALL loved your product."